These sign holders are a great size. They are half sheet size which is very convenient. At this size, the print out to be displayed allows for a very ledgible font size. 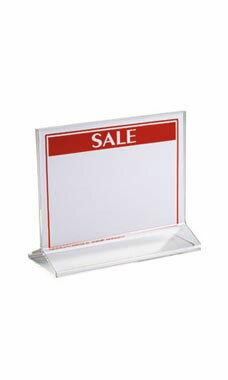 The sign holders are very sturdy,it is very easy to load the paper and it will keep it in place. The price is great and the product is exceptional. These were just what we needed. Just the right size and stable. Signage is key. These have a broad bottom and stand up well. I love these sign holders. No more loose signs on my vendor tables! These sign holders have proved invaluable. They make my display much neater, and I don't have to worry about my signage disappearing, falling over, or getting wrinkled or torn. This sign holder has been such a blessing! I can easily create signs for it because of its half sheet size! I can put it anywhere! The plastic is so tightly put together that we could not slide the signs in easily if at all. I would not prchase these again. I use this sign in my crafts booth to show my customers which forms of payment I take. And it also states that I take special orders. These sign holders are thick and durable! They can hold double sided signs. I am very happy with this product. And the price is very reasonable. Great quality for the price!! and super fast shipping!!! We are very happy with the sign holders, the quality is great very strong and are a great size for our table displays. Shipping was supper fast and will definitely order from Store Supply Warehouse again.